Bekament has opened two facilities for the production of powdered materials and liquid products, as well as an automated warehouse within the factory complex near Arandjelovac. The investment is worth more than EUR 8 million. According to the company's owner and director, Dejan Colakovic, the factory will triple its production with the new facilities. – With the new facility, we will increase our capacity from 130,000 to 350,000 tons a year, which enables us to expand to new markets – Colakovic said. He added that Bekament increased its capacity almost every year and even their sales, by 20%. As Colakovic says, there were four employees in the beginning, whereas 350 people work at the factory now. He announced that they would build a new plant and employ more workers the next year. The new facilities are fully automated, from the production and the packaging, to the storage of materials in the warehouse. By putting the new facilities into operation and automating the warehouse, Bekament will be able to produce as much as 100 tons of powdered products and 70 tons of liquid products an hour. 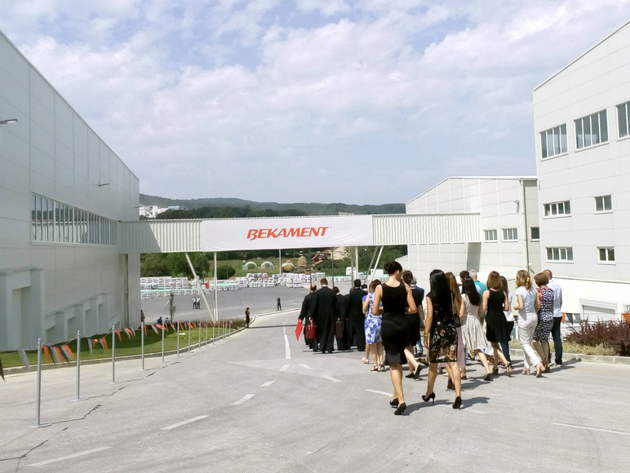 The opening of the Bekament facility was also attended by Minister of Internal Affairs Nebojsa Stefanovic, who explained that Bekament was a good example for other companies, both locally and on the state level. – As a government, we are very satisfied with Bekament's operations, as the company's production capacities are increasing day by day, which means that their share in tax payment, but also in employing people and developing the local self-government, grows each year – Stefanovic emphasized. Let us remind that, in 2016, Bekament launched a styrofoam plant with state subsidies in the amount of RSD 60 million, after which it continued investing. The company owns numerous certificates (ETA, ISO 9001, ISO 14001, ISO 18001) and its products are successful in both the local market and the markets of Croatia, Bosnia and Herzegovina, Macedonia, Hungary, Bulgaria, Montenegro, Slovenia and Albania. Bekament has existed for 25 years, and the Bekament foundation was registered last year. So far, RSD 70 million has been raised for the new polyclinic section of the hospital in Arandjelovac together with the local self-government and the Ministry of Health, and the reconstruction of the entire hospital is planned as well.